There has been a lot of speculation going into Thursday Night Football on whether to sit or start Tom Brady. I’ve even been asked whether Tom Brady is the better option over the likes of Cam Newton or Jay Cutler. It seems like everyone has piled on the Tom Brady bandwagon, which is no surprise considering his stellar 30-point game against the Buffalo Bills. 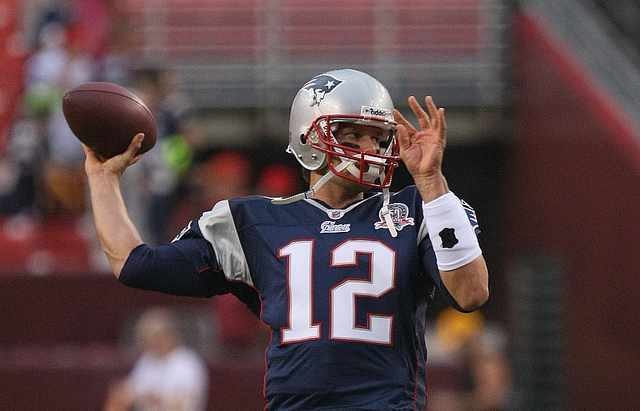 It was an impressive night for Brady, which included four touchdowns and 361 passing yards. Will Tom Brady live up to the hype this Thursday? Let’s look at the stats. Brady is currently sitting at 6-0 for his career in Thursday Night games, (the last two wins were against the Jets), and the New England Patriots have won 11 straight home games. Brady’s stock is also high due to a megawatt performance against the Bills, shutting up most of his fantasy football naysayers. More impressively, that was during an away game and Brady has historically played much better at home in Gillette Stadium.Would you like more good news for the Patriots? The offense is facing the New York Jets, currently ranked as the 3rd worst in the league against quarterbacks. Let’s face it, the Jets have looked pretty abysmal on defense the past few games, and a short week is not going to help them with preparation. Already this season the Jets have allowed 15 touchdowns through the air and have only managed one interception. Also in Brady’s favor, he has thrown 14 touchdowns and only two interceptions in the last seven meetings with the Jets. With the offensive line gaining strength and Brady’s favorite endzone target, Rob Gronkowski, looking healthier every day, things are looking rosy for the Patriots’ quarterback. While the Patriots have recently been hot against the Jets, historically, they are about even with the Patriots clenching 56 wins against the Jets’ 53. Division games are always played much closer, and the Jets have a way of sneaking in some stiff competition. Not to mention this is a rivalry game, and so far this season, rivalry games have proven explosive (think Steve Smith against the Carolina Panthers, Greg Olsen against the Chicago Bears). However, all this is pretty speculative. When it comes to stats to watch out for, I have one name: Muhammed Wilkerson. Through six games, Wilkerson already has four sacks and has pressured the quarterback an impressive 14 times. While Brady has been pretty reliable in the air (only 2 interceptions), his ground game is another story with three fumbles and 12 sacks so far this season. In the last 13 games versus the Jets at Gillette Stadium, Brady has been sacked 34 times. I expect a lot of pressure on Brady, with at least one sack from Wilkerson. The Rain. Right now, weather forecasts are calling for an 80-90% chance of “heavy rain” at Gillette Stadium. Typically rainy conditions result in more conservative quarterback play, with more over the middle passes and more handoffs. The Pats have faced the Jets in the rain as well last season, where they won by only a three points (13-10). In that game Brady struggled, only completing 19 of 39 passes for 185 yards. More importantly, he only completed four of 18 third down attempts. If the Patriots can’t move the ball down the field, all offensive fantasy players will suffer. Additionally, with more conservative game play comes more pocket time. We’ve already addressed that the Jets are likely to pressure Brady, and I expect that pressure to come early and often, and Brady will be forced to scramble in the rain. With three fumbles already this season, slippery ball conditions are no one’s friend, except perhaps in this case, the Jets’ defense. While Brady has been improving in fantasy totals, weather conditions will force both teams to rely heavily on their run game, resulting in less passes and less passing touchdowns for Brady. This benefits the Jets, as the Pats recently lost starting running back Stevan Ridley to an ACL tear. (Currently the Jets are ranked 12th in rushing yards, the Patriots are ranked 18th). If the Jets can shut down the Patriots run game and force the offense to rely on their pass attack, I expect the defensive pressure to take its toll on Tom. Brady’s current predicted points are 21.6 according to standard scoring at ESPN. My prediction: 14.5 points. If you have other quarterback options, look elsewhere.